The Chinese large cap ETF $FXI has been range bound since the 2007 top and 2008 bottom. The US indices have surpassed the 2007 top a long time ago. It has been seven months since the January 2018 top. It has made a 50% retracement between the 02/2016 bottom and 01/2018 top. At weekly level, it does appear to be bottoming. When it can close above 44.32, the weekly bottom is in. From the weekly bottom, we expect it to run to 11/21/2018, which is a Pi target. From the Pi target, we expect the cycle to continue the down phase to finally bottom in 2020/2021. Our long range study shows that starting in January 2018, the Chinese stock market has been running in the opposite direction against the US, because it couldn’t surpass the 04/2015 top, the previous cycle top. When the new cycle (started in 02/2016) met resistance at the previous cycle top (04/2015 high), it has no place to go but down. It has dropped 23.6% so far and it is showing signs of bottoming. This bottom is not a buy, we are going to look for rallies to dispose our Chinese stocks. The US listed Chinese have shown different performances than the mainland listed stocks. Some of the Chinese stocks such as $BABA, $JD, $MOMO, $BZUN have done great in 2017 along with the US stock market. The newly IPO’ed stocks $IQ, $HUYA and $SOGO also had a great run. Each of them has an impressive growth story. But all of them will be under pressure by the trade war and strong dollar. It is priced in the stock price that the Chinese economy will be affected by the protracted trade war. Previously we recommended $IQ and $SOGO. After dropping about 40% from the high in June, both are showing signs of bottoming. But we are not going to buy this bottom. In the contrary, we are looking for them to run to Pi target around 11/21/2018 to get out. We are bullish long term with the Chinese economy and stock market, but the strong dollar and trade war are headwinds that we are not willing to shoulder. 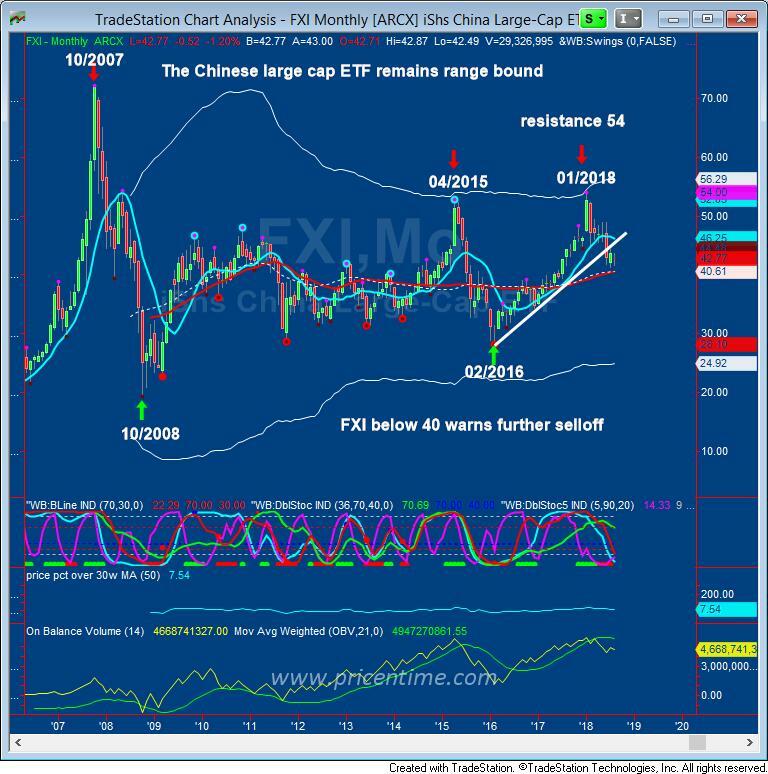 We will revisit the Chinese stocks in 2020/2021 time frame. We believe 2021 is a very critical year. It is 72 years from 1949, the year the People’s Republic of China was born. This entry was posted	on Sunday, August 12th, 2018 at 9:44 pm	and is filed under Forecasts. You can follow any responses to this entry through the RSS 2.0 feed. Both comments and pings are currently closed.